recently launched a new initiative called Video for Change which is designed to connect nonprofits and YouTube users to bring about meaningful change. As part of Video for Change, YouTube announced a partnership with Do Something on the Do Something Awards, an annual competition that identifies exceptional young social entrepreneurs, activists, and community leaders who are changing the world. Do Something has selected five young finalists who have already made a significant impact in the fields of muscular dystrophy research, global poverty, HIV/AIDS awareness, voting enfranchisement, and education for refugees. Of these finalists, the YouTube community will pick the winner who will earn $100,000 for his or her cause -- if you'd like to check out the finalists' videos and vote for your favorite, you can do so here. The winner will be announced next week at an awards show/concert at New York's Apollo Theatre. We're excited about this partnership because it provides a great way to showcase the young people who are doing good online and around the world, and increases YouTube's visibility as a place where average citizens can make a difference. As you may have read, YouTube and the YouTube Nonprofit Program recently launched a new initiative called Video for Change which is designed to connect nonprofits and YouTube users to bring about meaningful change. As part of Video for Change, YouTube announced a partnership with Do Something on the Do Something Awards, an annual competition that identifies exceptional young social entrepreneurs, activists, and community leaders who are changing the world. or on the NTEN website, we are currently hosting a webinar series for Google Grants beginners called "Learning to Use and Maximize Your Google Grant". We kicked this series off on Thursday, May 14th with an introductory session titled "Setting Your Organization Up for Success with Your Google Grant". AnnMarie from the Google Grants team covered the details of a Google Grant, how it is different from a standard paid AdWords account, how to identify goals for your account, how to navigate your campaigns, and more. Common questions and the importance of active account management were also discussed. You can view slides from this session here and purchase the recording here. Our second session, titled "Learning How to Use Your Google Grant", was held Thursday, May 21, and was led by Mahin, an AdWords specialist and long-time Google Grants volunteer. In this webinar, Mahin discussed account management processes, including how to make basic changes to your ads, keywords, and campaign settings. She also reviewed several AdWords tools that all Google Grants participants should be utilizing to make the most of their accounts. The majority of the session detailed how to effectively evaluate campaign performance, whether through reviewing your account statistics, running reports in the Reports Center, or using a more advanced tool like Google Analytics. If you are interested in these topics, you can view the slides from Mahin's session here and purchase the recording here. If you have attended these webinars and want to discuss your takeaways with others, please share your thoughts on the Google Grants Help Forum. If you would like to attend the final session in the Beginners series, titled "Maximizing Your Google Grant to Attain Your Advertising Goals", you can find info and register here. For information about our upcoming four-part Advanced webinar series, please visit NTEN's site for more details. As you may have read on our blog or on the NTEN website, we are currently hosting a webinar series for Google Grants beginners called "Learning to Use and Maximize Your Google Grant". We kicked this series off on Thursday, May 14th with an introductory session titled "Setting Your Organization Up for Success with Your Google Grant". AnnMarie from the Google Grants team covered the details of a Google Grant, how it is different from a standard paid AdWords account, how to identify goals for your account, how to navigate your campaigns, and more. Common questions and the importance of active account management were also discussed. You can view slides from this session here and purchase the recording here. ?”, questions such as “To what kind of company can I commit?” kept me up at night. I knew I couldn't work for an organization whose philosophy did not seem right to me. Google’s “Don’t Be Evil” principle, which permeates everything the company does, is what made me look twice. Now that I’ve been here for almost a year, it's initiatives like Google Grants, a program I regularly volunteer with as an AdWords specialist, that have confirmed for me again and again that I’ve picked the right place for me. Earlier this week, I conducted an AdWords seminar for a group of non-profit representatives in North Carolina. Talking to them about the marketing challenges that their organizations face, I realized just how much of an impact Google Grants makes for each of these organizations. When marketing dollars are not only scarce, but even non-existent in a small non-profit organization, a free AdWords account can really mean the difference between sustaining a volunteer base and having to close its doors. Recognizing this, I can say with confidence that no matter how busy I get with my primary job at Google, I will always find time to be a Google Grants volunteer. As far as I am concerned, the Google Grants program really takes that “Don’t Be Evil” principle to a whole different level. The amount of passion and commitment that I've seen amongst the Grants team is one thing that makes me confident in standing behind Google’s philosophy. To me, it’s simple: when you know that you can make a difference, there’s no choice but to get inspired – and get involved. As college graduation loomed just a few months away, my friends and I were going through a very stressful process: the job search. In addition to questions like “Am I qualified?” or “Will anyone want to hire me?”, questions such as “To what kind of company can I commit?” kept me up at night. I knew I couldn't work for an organization whose philosophy did not seem right to me. Google’s “Don’t Be Evil” principle, which permeates everything the company does, is what made me look twice. Now that I’ve been here for almost a year, it's initiatives like Google Grants, a program I regularly volunteer with as an AdWords specialist, that have confirmed for me again and again that I’ve picked the right place for me. Explore non-profit and public benefit maps with our new Showcase, where you can interact with Google Earth and Maps projects right from within the webpage. We've added Maps API and Earth API applications as well as My Maps. Visit in-depth case studies for several projects from the Showcase. Some case studies, like Appalachian Voices and Clean Up the World, contain new videos about how the organization used maps to change the world. Create maps with our enhanced Tutorials section, which includes seven new Google Earth tutorials, such as how to create a tour and then embed it on your website. All of the new tutorials have videos to watch before you get started. You can also plan your project before you dive into your mapping work. Also new is a list of Tools and Resources that will help you create your maps. Connect with other non-profits at our new Community & Grants section, which contains many different opportunities for non-profits. 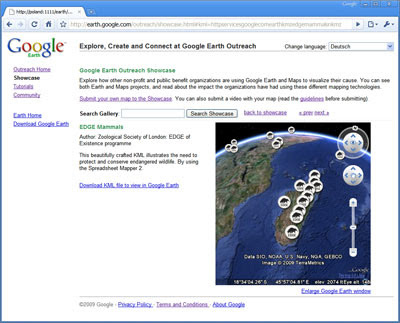 If you're an eligible non-profit, you can apply for Google Maps & Earth software grants, including Google Earth Pro, SketchUp Pro, and now Maps API Premier. In our new Developer Marketplace, you can find a list of programmers and developers with experience with public benefit mapping to help with your project. Finally, you can sign up for our quarterly newsletter where you can learn about new updates, upcoming trainings, and more! ads, please read on for some helpful pointers regarding Google Grants and AdWords website and link policies. As a Google Grants participant, you received initial approval to link your ads to the URL you listed in your application. Since organizations' websites may evolve over time, we encourage you to notify us if there are significant changes to your website content, organization focus, or mission. An example of a significant change is if your organization shifts its focus from distributing email newsletters on the topic of child safety to selling child safety products online. A minor change to your site layout or the addition of a new website section does not count as a significant change. 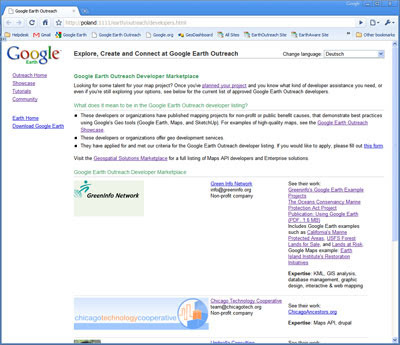 It's also possible to promote additional websites that your organization owns through your Google Grants ads. We ask that you notify us beforehand to provide detail on how you intend to promote the additional website and share proposed ad text and keywords. It's important to note that your organization cannot link your ads to websites that you do not own. In cases such as project co-sponsorship, in which your organization would like to run ads for a URL that does not belong to your organization, we recommend linking your ads to a specific landing page on your website first, then linking from that webpage to the different URL. We require that your ad's display URL match its destination URL (the URL of your landing page); we monitor and don't allow ads with display URLs that redirect to different destination URLs. For example, if your destination URL is www.Google.com/Grants, your display URL must be www.Google.com or www.Google.com/Grants. The domains and the extensions should match exactly. In addition to Google Grants approval for your website, any websites in your ads must also meet our AdWords Link Guidelines. Please review these guidelines prior to creating your ads. If your organization is considering changes to your website or adding additional websites to your Google Grants ads, please read on for some helpful pointers regarding Google Grants and AdWords website and link policies. That said, Google Grant recipients are always eager to hear advice from people who are well-versed in the best practices of AdWords campaigns. This advice can come from the new Google Grants Help Center, the Google Grants Help Forum, or the Google Grants blog. Recently, we asked two members of the Eastern Michigan University AdWords in the Curriculum course to offer their expert advice to nonprofits using AdWords. "My biggest pointer would be: don't try to do too much with just one ad," said Eastern Michigan University student John Hanna. "Keep the ads very focused on one objective and tailor the ad, keywords, and landing page to that objective. You can always make other ad groups if you are trying to accomplish more than one thing with AdWords." "I think the most important thing to do with Google AdWords is to be very creative and willing to make changes," noted Eastern Michigan University classmate Steven Pottenger. "If you target your audience to what you want, you will see a increase in accomplishing your goals." After creating a successful campaign, it may seem risky to make any changes for fear of ruining the strong performance. But search trends change on an hourly basis, and search volume can vary a great deal from one week, month, or season to the next. What worked beautifully before may no longer be working, which is why we encourage Grantees to monitor campaigns and make regular revisions. Google Insights for Search and the Keyword Tool offer insight into what people are searching for and will help you keep your keyword lists timely. During their time with AdWords in the Curriculum, John and Steven worked with Heritage Works, Habitat for Humanity for Huron Valley, and the Organization for Bat Conservation. A major benefit of Google AdWords is that it allows you to self-manage your online advertising. Unlike other advertising platforms that require long contracts, tearsheets, or the laborious creation of ad material, AdWords gives non-profits and businesses alike the ability to build successful advertising campaigns from the comfort of your office, home, or both. social networks that can help you do just that. With all of the buzz, though, it can be easy to forget about your organization's own website and the social features you can add directly to it. Google Friend Connect offers quick and easy ways to strengthen the community that visits your site by enriching it with social features. With Friend Connect, anyone visiting your site can join and discover other members on your site by using accounts from a variety of services, including Google, Yahoo, AOL, and Twitter. You can also choose from a gallery of what we call "gadgets" to add features such as commenting, ratings and reviews, and opinion polls to your site. There's even a gadget for making your event marketing more engaging and social. It only takes a few minutes to add Friend Connect to your site and you don't need any programming skills whatsoever. Upload two files to your site, then copy and paste a few snippets of code, and Friend Connect does the rest. It's that simple. And we're constantly coming up with more features you can add to your site, such as the social bar and the Get Answers gadget. To stay updated on what's going on with Friend Connect and other Google products helping to make the web more social, visit the Social Web Blog. Building an online community is a great way to generate support for your cause, and there are lots of social networks that can help you do just that. With all of the buzz, though, it can be easy to forget about your organization's own website and the social features you can add directly to it.
. If you'd like to review previous round-ups, just click here and read through previous months' round-ups or search for "resource round-up" from the search box at the top of the page. Our resource round-up for May includes articles about harnessing social media to achieve non-profit goals, blending technology with diplomacy, and charities merging to stay afloat. We've also included a great resource from TechSoup on learning more about technology and building your IT skills online. If you come across resources that would be useful to the greater non-profit community, feel free to post it to the appropriate topic in our Help Group so that everyone can benefit. If there are some resources you'd like to see featured in these round-ups, let us know. If you'd like to review previous round-ups, just click here and read through previous months' round-ups or search for "resource round-up" from the search box at the top of the page. Grantee Best Practices, Tread Lightly! , is strategically positioned to spread its message of outdoor ethics to an engaged audience of outdoor enthusiasts. By leveraging the power of AdWords and measuring metrics meaningful to their org, Tread Lightly! has been able to improve their ability to achieve their mission in ways that may be helpful for your org, too. Tread Lightly! dedicated a staff member to work on their AdWords account with the goal of increasing the quality and number of ads and keywords in their campaigns. As a result of their recent work, site traffic has increased 271% since the same time last year. Tread Lightly! created 42 different ads with direct landing pages that connect people instantly to quick tips for their type of recreation. Rather than risk losing these interested visitors as they click around the site, these ads connect them right to the information they're seeking. For instance, this ad connects users to this page that is focused specifically on tips for responsible fishing. Previously, this audience of fishermen was one they struggled to reach, however, since launching this new ad group they've seen an enormous increase in traffic! Tread Lightly! was seeing a spike in the popularity of UTVs, resulting in a growing need for UTV ethics. As a result, they created an ad group focused on UTV ethics with unique ads pointing to a targeted landing page, which helped them successfully reach this new audience of recreationalists. If you have ways for users to engage with your organization, you can track them. This helps you measure brand awareness and engagement and see how your audience is growing. Tread Lightly! encourages visitors to become a “Friend of Tread Lightly!” as a pledge to recreate responsibly, and through tracking they've seen an increase of over 50% in new "friends". Look at your org's mission to see what goals you have as a non-profit that could benefit from tracking. This can be an easy way to relate marketing efforts back to the mission of your organization. Tread Lightly! wanted to become more involved in the water recreation community which was reflected during last summer's water sports tips ads, when they saw nearly 10,000 clicks to their boating/personal watercraft tips and video. Measuring brand or cause awareness is a challenge for all businesses, for-profit and non-profit alike. Tread Lightly! equates impressions to valuable exposure because they know that it helps associate Tread Lightly! with outdoor recreation - an awareness goal. In their yearly analysis, they found that their campaigns received approximately 15.3 million impressions - even if searchers never clicked through to their site. That's a lot of awareness for minimal effort! If you designate individual ad groups in your campaign to brand awareness, you can validate their ROI by tracking growth in impressions. Tread Lightly! is a nonprofit organization that strives promote responsible outdoor recreation through ethics education and stewardship. Tread Lightly! has been a participant in the Google Grants program since 2007 and uses tracking tools and reporting within AdWords as part of their online marketing program. With outdoor recreation season coming into full swing, one Google Grantee, Tread Lightly!, is strategically positioned to spread its message of outdoor ethics to an engaged audience of outdoor enthusiasts. By leveraging the power of AdWords and measuring metrics meaningful to their org, Tread Lightly! has been able to improve their ability to achieve their mission in ways that may be helpful for your org, too.
. After the positive feedback we received from last year's series, we decided to work with NTEN again to offer two tracks for current grantees, one beginner and one advanced series. Both tracks consist of multiple sessions designed to help your organization learn how to maximize your Google Grant and meet your goals. For more details and to register, please visit NTEN's website. Hope you can join us! And for those who can't attend or those who want to brush up before the sessions, please check out our educational resources available in the Help Center, including our Beginner's Guide, Analytics Guide, and online trainings. We're pleased to announce that in May and June, we'll hold two series of Google Grants webinars with NTEN, the Nonprofit Technology Network. After the positive feedback we received from last year's series, we decided to work with NTEN again to offer two tracks for current grantees, one beginner and one advanced series. Both tracks consist of multiple sessions designed to help your organization learn how to maximize your Google Grant and meet your goals.